Accompany Eugene Uttley on a mythological "hero's journey" to another world and back again, and join him as he articulates the prize that he won there -- The Ultimate Boon. Through his struggles in coping with schizophrenia, Uttley has come to know what he wants. Now he just needs to figure out how to get it. This experimental open letter includes original and appropriated prose, poetry, song, prayer... memoir, travelogue, sketches of Uttley's present-day life, and literary exegesis. Its many sources and topics are ranging, but circle always back to the overarching theme of recovery from mental illness through better knowledge of self and becoming more whole, a complex process both mental and spiritual, which entails increasing awareness of connectedness to the greater whole, the infinite. Eugene Uttley is a lifelong reader and author (diapers and a typewriter). In addition to working on literary fiction, he is currently doing free reviews of memoir and narrative & experimental non-fiction. He has a BA in English and half-an-MA in Literature. He’s a sometime composition TA and ESL instructor and now a student again, of accounting. The author of two books on coping with schizophrenia (as he does), he’s a fan (but not follower) of Carl Jung. Some authors who are dear, dear to him are Haruki Murakami, Charles Portis, Kingsley & Martin Amis, J.P. Donleavy, D.F. Wallace, Thomas Pynchon, Augusten Burroughs, Jack Kerouac, and Alan Watts.To contact him (with a review request or for any reason at all, really) please use mruttleysz at gmail dot com. 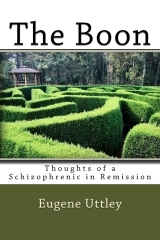 For more on his work in re schizophrenia, including an excerpt, see his Authors Den page. Find the giveaway and other hosting blogs here. Girl Who Reads is an advertising affiliate with Amazon and IndieBound; a small fee is earned when purchases are made using the above links. Featured Books is a free announcement feature and all information is provided by the author unless otherwise noted. Tours, Giveaways, No Reading...Oh My!